Abdominal fat is serious. It is the root of many health issues, including both the contracting of Type II diabetes and Erectile Dysfunction. To make things even worse, women are extremely firm in letting the world know that men with the lean Hollywood look are far more appealing to them than men with soft, flabby bodies. Guys, if you are truly worried about the excess fat you have put on in the past few years, take hope. You can get rid of belly fat by committing to an old-school approach of optimal nutrition and workouts to gain lean muscle...both of which will naturally increase your metabolism over time. It took time to put on stomach fat...and it will take time and effort to get rid of it. There is NO quick fix to lose stomach fat. Expensive "secret" supplements will not do it. Fat loss diet pills are dangerous. And, the idiotic exercise gadgets sold on late night cable TV will just burn your wallet...not your love handles. * Of the Big 3 components (diet, weight training, cardio) of a fat loss program, diet is by far the most important. You will have to say goodbye to eating what you please and eating unconsciously. * You must commit to eating like an athlete. Knowing EXACTLY what you are putting in your mouth and the effect it will have on either building lean muscle or being stored as belly fat. * You burn stomach fat by creating a slight calorie deficit from week to week. Reducing the amount you eat, while engaging in consistent workouts will get you there. * Making good food choices means getting rid of sugar foods, junk fast foods full of calories and fat, and processed foods. Like an athlete, you will have to educate yourself about each of these groups. * Commit to drinking more water. In addition to making you feel less hungry, it will allow your organs to process food more efficiently. * Regular and consistent strength building workouts with weights are a must for increasing your metabolism. * In addition to your weight workouts, you must begin an active life that means getting away from your cell phone, your computer, and your TV. Doing some form of cardio everyday conditions your metabolism to keep burning stomach fat. * You need to gain enough strength that you can start interval training workouts...bursts of intense effort separated by periods of active rest. In order to burn stomach fat, you MUST begin eating and working out consciously. You must look at a timeline of 25-36 weeks to begin seeing significant results. It took time to put on stomach fat and it will take time and effort to get rid of it. The Truth About Six Pack Abs is our leading product and also the most popular (because it works) program on the Internet. * Mike Geary's best-selling program has helped 1000's of both men and women burn belly fat and keep it off. * His program focuses on you learning to make good food choices, understanding what situations sabotage your fat loss goals, and engaging in workouts that are purposeful. * This is old-school...eat consciously...work out intensely...and burn stomach fat. * Mike's program features eight levels of strength training workouts and eight levels of abdominal workouts. 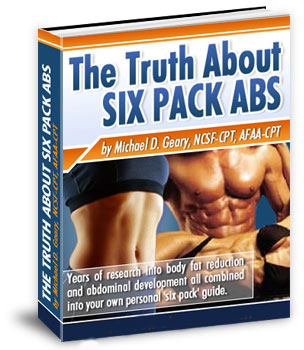 * At $39.95, The Truth About Six Pack Abs will provide you a top-level comprehensive program for the cost of two extra-large pizzas. If you have been discouraged about the body reflected back at you from the mirror and you are embarrassed to take off your shirt around women, don't wait any longer. Checkout this proven plan to burn stomach fat.